Australia is known for it's killer great white sharks. Even though more people die each year in California from shark attacks than off the coast of Australia, there is something about being Down Under that makes you think twice when you go in the water. That didn't stop us though. 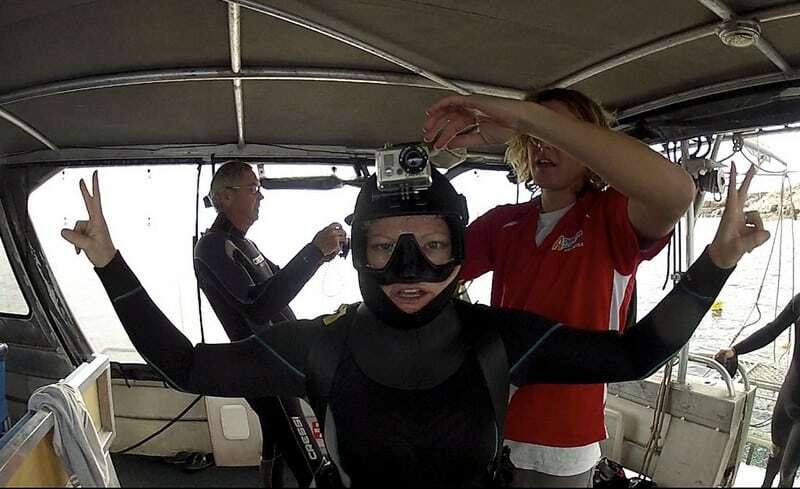 Even before our cage diving experience, we hopped in the water with dolphins and sea lions. I admit that sharks were on my mind though. While we snorkelled with the seals, I kept thinking to myself, “A seal is the Great White Shark's favourite food!” “Maybe we shouldn't be hanging out off shore with them.” Our guide had an electronic pulse strapped to his ankle so I guess we were safe enough, but I most certainly didn't stray from the 10 metre radius safe zone. 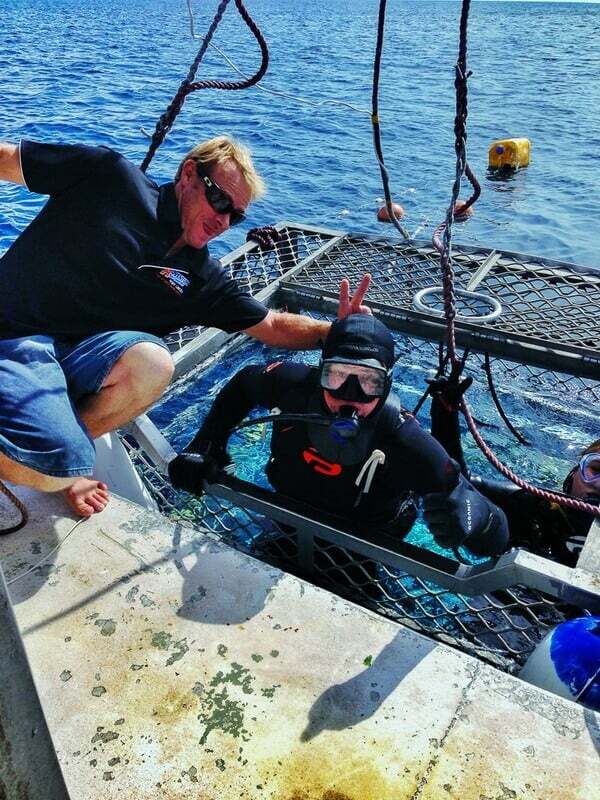 We had already been cage diving once before in South Africa and had the biggest thrill of our lives. We had several encounters with frisky great white sharks and we even had an “incident” when the guy who chums the water was pulled unexpectedly in by a great white. 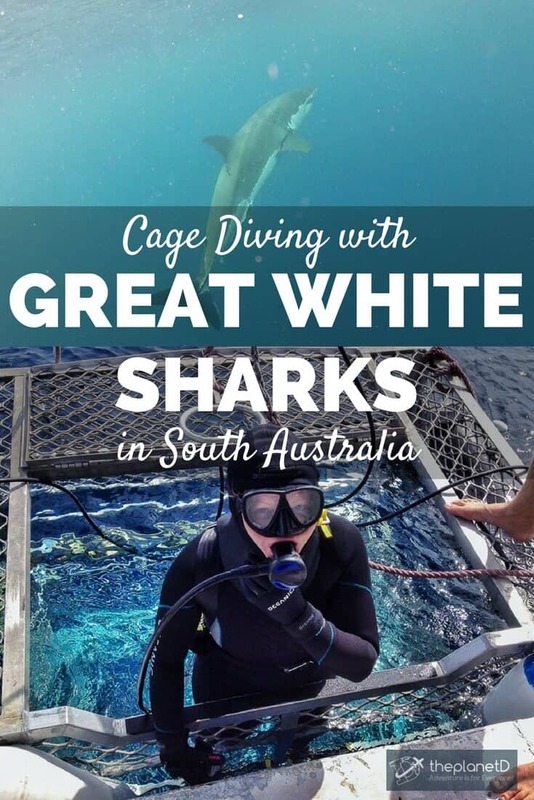 (we caught it all on film too – link below) When we heard that South Australia was the other place on earth that a person could get in the cage and see great white sharks up close and personal, we had to jump on the chance. 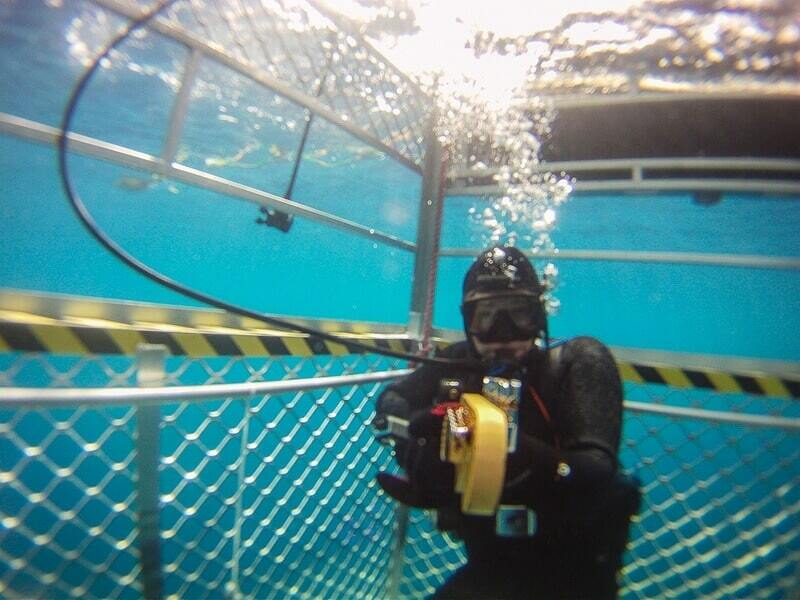 See our South Africa Cage Diving Experience and compare. It was early in the morning when we were picked up at our hotel in Port Lincoln to transfer to the marina where we met our captain and guide for our day on the water. Unlike our trip in South Africa, we had a two hour drive out to “Shark Bay,” so we settled in, had a cappuccino and enjoyed the sunrise. We were diving with Adventure Bay Divers, a company that has won several eco-tourism awards. They use sound waves to attract the sharks rather than chumming the water with fish guts and juice. I was expecting the sound waves to be some sort of high tech sonar, but as it turned out, the sound waves ended up being rock music. More specifically ACDC. Actually, there were an array of tunes and if you are a hard rock fan like Dave and myself, you will love the playlist. 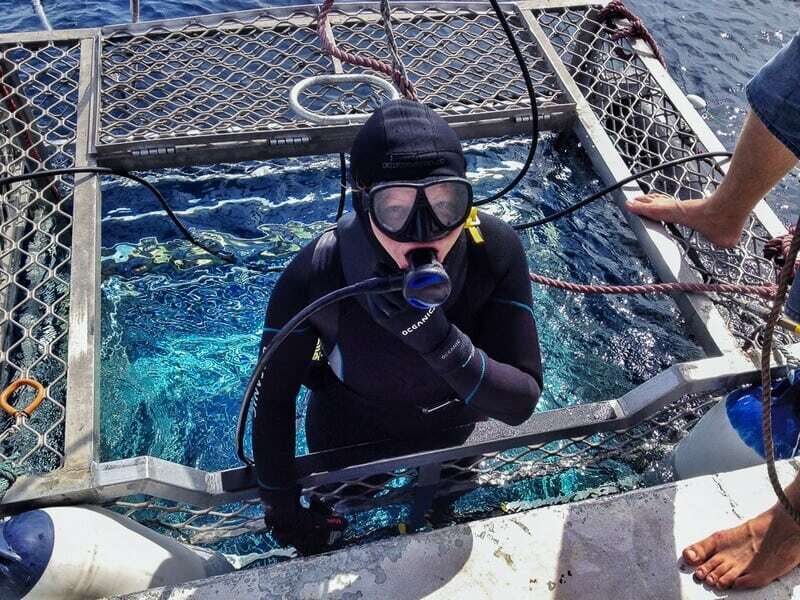 Dave and I felt pretty comfortable, since we had just dove with great whites a month earlier, so when they asked for volunteers to go in first, we were quick to raise our hands. The water was a chilly 16 degrees Celcius (60 Fahrenheit) so I must admit, I was more afraid of the cold than the sharks. I had trouble catching my breath and breathing through the long hose of the surface fed air, but once I settled in and warmed up, I felt much better. Within minutes of getting in the water, we saw a shark. It was much bigger than the sharks we saw in South Africa, but far less active. This shark floated around the boat and the cage for a little bit before disappearing into the abyss. He didn't seem to love the music as much as we did. We all took turns getting in and out of the water. It was near the end of the season so we only had 6 people on the boat which was awesome. It's always great to have a fun group when you are stuck on a tiny vessel. We had a lot of cage time if we wanted it, so we spent most of the day underwater. Sadly, no other sharks decided to grace us with their presence. Unfortunately that's what happens with Mother Nature, sometimes you win and sometimes you lose. We still had lots to keep us occupied thought. The guys at Adventure Bay Charters are prepared for all possibilities, and even though we didn't see anymore sharks, we still had fun under the water. The music was cranked and they handed down a guitar for us to play. Not only did we play guitar, we boogied too. Watch the video and you'll see what fun we had. We put on the old GoPros and hammed it up for the camera. Give Dave and I a prop and we're all over it. I really think that we were circus performers in another life. We can entertain each other for hours. The day on the boat was a lot of fun. 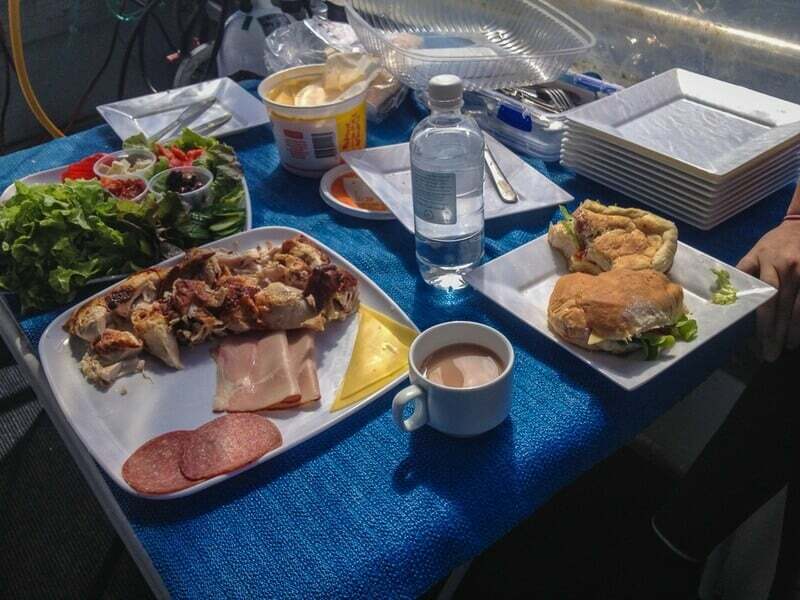 We were served a delicious buffet lunch and all the cappuccinos we wanted. It was a beautiful day too. Not too hot, not too cold. We had the chance to get in the water as much as we wanted and if you are a die hard diver like most that we know, you'll want to keep getting in to see what's up. Fish floated by and there was always a chance to see another shark, so we all kept alert and paid attention. You just never know what you'll see. Even if you are not a certified diver, you can cage dive with sharks. You are only a few feet below the surface of the water and if you are uncomfortable in any way, you can pop back up in a heartbeat. The guys are right there to take care of you and to help out if anything happens. 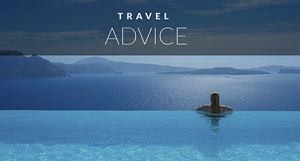 If you have never dove before, don't let that stop you, it's the perfect introduction to diving. I guarantee you'll be hooked after you see a great white in real life. We haven't been certified divers for a few years, but all these mock diving holidays are starting to make us feel that we should refresh our PADI Courses. And here I thought I'd never dive again. The guides were a lot of fun while being very professional and safe and they put on a great tour. Even though we only saw one shark this day, it was still a fun and exciting time. Being in the water with a great white shark is a thrill of a lifetime. Period. Even if it is only one. It's still an amazing thing to witness. And hey, still get to say we looked a great white shark in the eye. If we ever have the opportunity again, we'll be in there for sure. 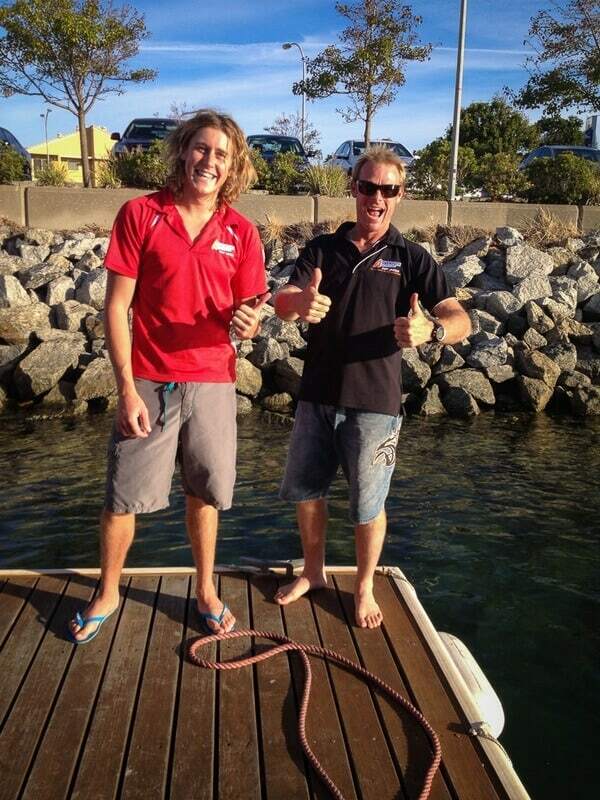 I wonder where our next Great White Shark encounter will be? We'd love to hear about your shark experiences, tell us where we should have our next shark encounter! 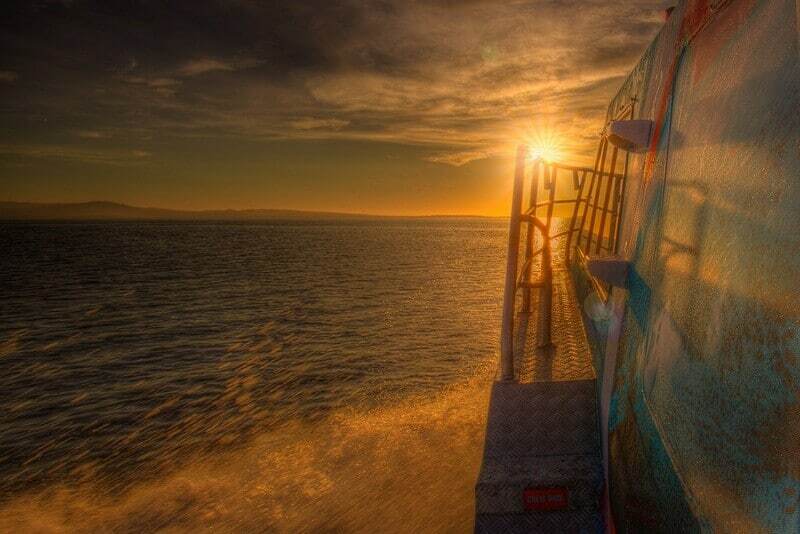 Adventure Bay Charters offers Great White Cage Diving as well as several other excursions in the Port Lincoln area. Price is $345 Australian dollars which is expensive, but that is Australia in a nutshell. Even the locals will agree with you, Australia is expensive. There are daily flights from Adelaide to Port Lincoln or you can hire a Ute from Adelaide, check out Complete Ute, Van and 4 Wheel Drive Hire. Our trip was made possible by South Australia Tourism. Everything we ever wanted out of Australia happened in South Oz. 28 Responses to "Great White Sharks, Guitars and Gettin’ Down, Down Under"
I gotta admit the thought freaks me out (of being in the cage) but it’s also one of those “once in a lifetime” moments, so kudos to being able to explore it. 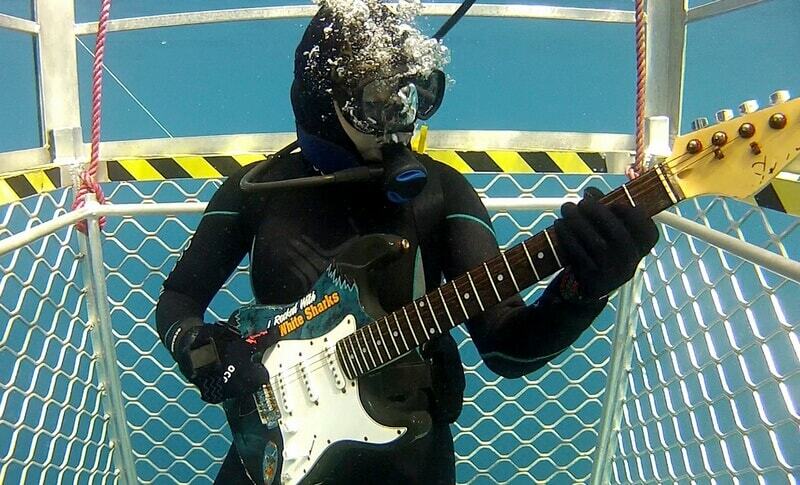 Is it weird that I think it’s more interesting you got to play the guitar underwater than see a great white? 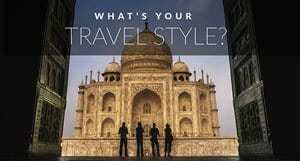 That’s awesome experience. I wonder what I’m going to do if I where in her situation. Great White is just to scary. But really, that looked like a great experience! Haha, that’s what they say, ACDC works the best! Love the video! It’s amazing to read about the experience but even better to see both the gorgeous great white (and the Planetd’s playing impressive air guitar)! My favourite part though is the focus on eco-tourism and the introduction to the use of sound waves rather than chum to attract sharks. Very informative! While i appreciate all the photos taken by people who get in the water with sharks, it’s safe to say I’ll never be one of them. I’m fascinated by sharks and so what to go cage diving with Great Whites! Looks like you still had a lot of fun even though you only saw the one shark. Thanks Jennifer, yes we did have a lot of fun. 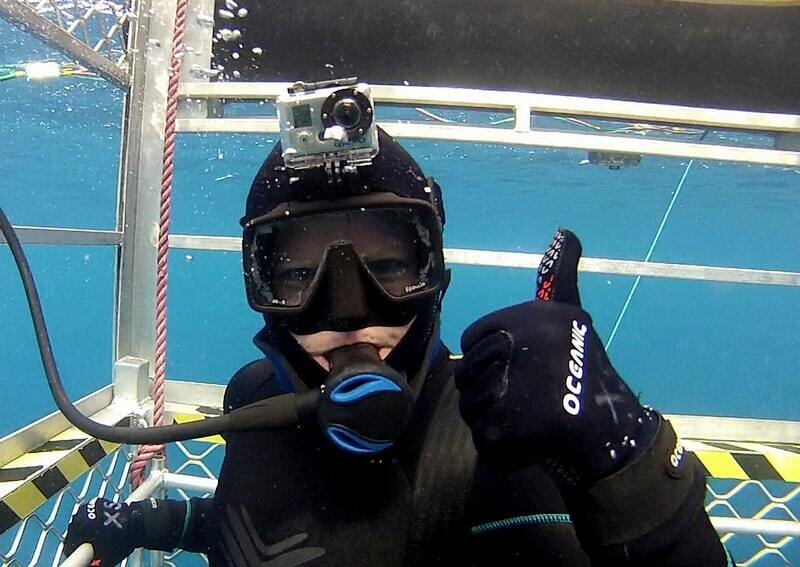 Cage diving with the sharks looks awesome but I’m not sure I could ever do it. I think I’m happy watching people like you do it instead! Hi Ali, I think you could do it. I remember taking the boat out to see the sharks in South AFrica and everyone was dead quiet. People were a bit nervous, but once you get in the cage it is so much fun! WOW!! Swimming with sharks!!! How cool is that!!! 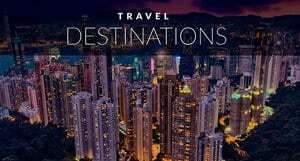 Even though it is a little on the expensive, what an amazing experience for you!!! BTW, I stumbled upon you blog on twitter and I am your newest follower!! Yes, it is expensive. We were amazed with the prices of everything in Australia. 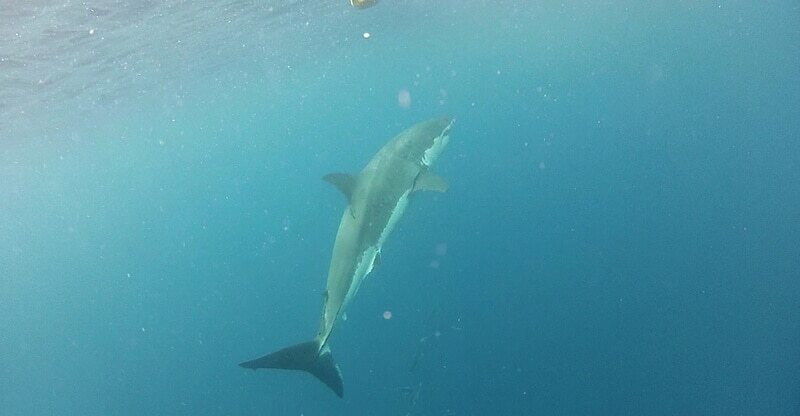 If you make it to South Africa, it’s much more reasonable to dive with the Great Whites. But Australia is pretty amazing too, and you just have to be prepared to pay heavily for everything there. Thank you, yes it certainly was! Too bad you didn’t get to see many sharks. At least there was one. I love that you played music for the sharks though. So true, there are many trips that go out and don’t see any sharks, we felt lucky to see one. There’s always the chance that we could go out and see nothing. We held out posting this one for shark week, I have to admit. 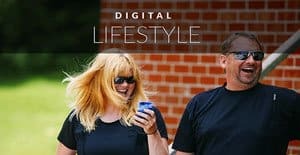 We had video to edit and were a little overworked after returning from Australia, thought, “we’ll give ourselves a bit of a break and wait to post it. Sounds like an fun experience. No shark for lunch? Haha, no no no, shark.